As concrete coatings evolve, managers need to understand which products will work best for their substrates. Every concrete coating has a service life, and eventually technicians will need to repair or recoat the surface. If concrete coatings are not correctly applied, the result can be a number of expensive issues. One key element of effective concrete coating application is surface preparation. “Mechanical preparation of the concrete is critical for longer term performance of any coating system,” Tierney says. “This includes diamond grinding, media blasting and other methods. When concrete cures it creates a laitance layer on the surface that is very weak. Removal of this layer is important to create a strong bond between the coating or flooring system and the concrete. In some instances,technicians might need to perform a chemical cleaning of the surface before the mechanical cleaning takes place. “Some concrete slabs might need a chemical cleaning in order to remove heavy grease, oils or other contaminants before the mechanical means are utilized. With these two methods, the thickness of the coating system and how the coating system obtains its bond will dictate which one to use. 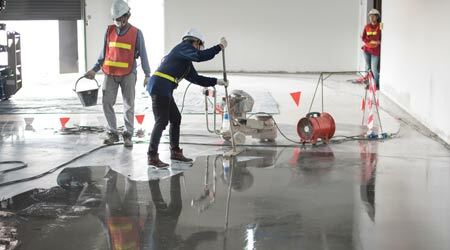 Once the concrete coating has been successfully applied, performing proper maintenance procedures is essential to extend the life of the coating. For example, all protective coatings need cleaning occasionally.